Indian Elections: Can You Help Make Sense Of Them? I realized five years ago, when the Congress Party came back into power after everyone had seemingly given them up for dead, that Indian politics is way too complicated to try and predict, especially from the outside. Still, I wonder if readers have been coming across insightful articles or websites that explain what is happening in individual states or regions of the country, or analyze trends in a useful way. If so, could you put your recommendations in the comments below? Here are two things I’ve read in the past day that I thought were interesting: the New York Times, on Narendra Modi, and Soutik Biswas, at the BBC, on why the 26/11 terrorist attack in Mumbai is not likely to be a national election issue. It does seem clear that the steady, incremental shift from national to regional politics is continuing in the current election. On the one hand, that is bad, because it means that whatever government comes to power at the center will be inherently weak and coalition-based. On the other hand, that weakness at the center can also be a good thing in terms of maintaining overall stability — not always easy in a country with 1 billion people. Even if a far-right or far-left party comes into power next month, they will not be able to do anything too drastic for fear of losing coalition support. Second, it seems like “Hindutva” has seemingly lost some of its force as a national issue. The BJP and its allies might still prevail, but they’re playing the “nationalism” card more than the communal card. Third, caste politics seems to be more prevalent than ever. I find that to be one of the most depressing and deadening things about Indian politics. QUESTION: Can you reassure the American people that, if necessary, America could secure Pakistan’s nuclear arsenal and keep it from getting into the Taliban’s hands, or worst-case scenario, even al Qaeda’s hands? MR. OBAMA: I’m confident that we can make sure that Pakistan’s nuclear arsenal is secure, primarily, initially, because the Pakistani army, I think, recognizes the hazards of those weapons falling into the wrong hands. We’ve got strong military-to-military consultation and cooperation. I am gravely concerned about the situation in Pakistan, not because I think that they’re immediately going to be overrun and the Taliban would take over in Pakistan; more concerned that the civilian government there right now is very fragile and don’t seem to have the capacity to deliver basic services, schools, health care, you know, rule of law, a judicial system that works for the majority of people. And so as a consequence, it is very difficult for them to gain the support and the — the loyalty of their people. So we need to help Pakistan help Pakistanis. And I think that there’s a recognition, increasingly, on the part of both the civilian government there and the army, that that is their biggest weakness. The South Asian Summit, held this past weekend in D.C., was an amazing experience for which SAALT deserves a great many thanks. The passion present in the room was undoubtedly invigorating to all in attendance. Most importantly, I learned something about the fundamental hurdles many of these South Asian American activists face in the pursuit of their varied causes. I believe that some of these hurdles have solutions that readers of this website (with their varied skills) can help with if only made aware of the challenges. Over the course of the next several months I plan to profile many of the organizations that attended SAALT and solicit from them what their needs are so that some of us can pitch in. As a blogger residing behind the computer I rarely get to meet first-hand the dedicated activists we often write about. It is the difference between seeing ice cream and tasting it. The folks at this conference breathed their causes and it makes you re-evaluate whether or not you are doing enough in your own life. This really is the time to think and act beyond your immediate sphere. At the beginning of the conference we were each handed a post-card which we were to self address and hand back to the organizers. The post card asked a single question: “What did the Summit inspire you to do?” The message we wrote was for our own benefit and the post card was to arrive in the mail to remind us of our commitment. Well, that scenario probably never happened to Shobha Tharoor Srinivasan, but she’s nevertheless peeved about being called “aunty” by people she barely knows, as she states in this month’s Khabar (her piece originally appeared in India Currents, linked below). Taz’s First DC SM Meetup — This Sunday! This week Desis will be congregating in the nation’s capitol for SAALT‘s South Asian Summit (registration is closed, but tickets still available for the Change Maker Award). Both Abhi and I will be sitting on panels for the summit and we were thinking, why not incorporate a classic Sepia Mutiny meetup into the mix? So how about it? 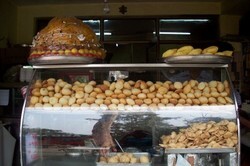 A ‘Chaat and Chai’ 4-7 pm Sepia Mutiny Meetup on Sunday April 26th? Though D.C. was home way back in the days, I’ve never been to a D.C. meetup, and would be really excited to meet Chocolate City’s mutineers. RSVP in the comments with your e-mail address if you can make it. Recommendations for the perfect chaat and chai joint for our meetup. I went to Coachella on the wrong day it seems. Had I known this trio would be a trio, I would’ve trekked desert-ward one day sooner…(Hat tip to Aziz’s twitter). I’m thinking a) M.I.A. lookin’ that skinny so soon after baby? ; b) What is Aziz Ansari thinking with that expression on his face? 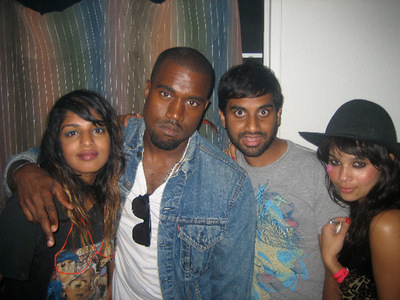 ; c) Can you imagine a M.I.A./Kanye/Aziz remixed mashup? It’d be funny, for sure. the kahani trailer from Suneel Gupta on Vimeo. 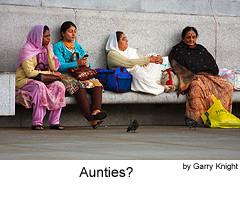 I’m borderline obsessed with the ideas of documenting the history of South Asian Americans, and am completely fascinated with how this project is merging documentary with social networking with user generated content. There is so much potential. The Kahani Movement…ties the concept of StoryCorps to the technology of Web 2.0 by inspiring Indian Americans to tell stories of their early days in the U.S. from the comfort of their own kitchen tables and then share this content on a newly developed social network. From Whitehouse.gov we see some pictures from “behind the scenes” at the Summit of the Americas that just ended (thanks for the tip Siddhartha). 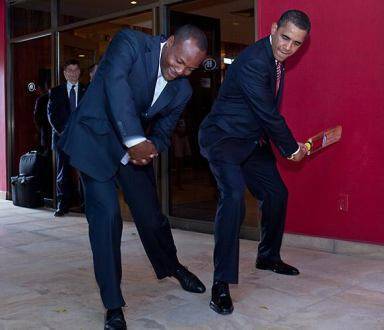 It looks like Obama is giving some guy named Brian Lara advice on how to swing a cricket bat. I am not sure if his form is right. It might be why Tiger Woods was invited to the White House yesterday. It also looks like Obama’s wicket is wide open. You know what time it is. It is caption contest time. Go at it. Allegations of witches and witchcraft are not new to India and at least a few times a year the western media highlights them. They also occur quite regularly in the U.S. and all around the world for that matter. It is a phenomenon that spans borders, cultures, and time. A must-read piece at Slate today highlighted two new books (The Enemy Within and The Last Witch of Langenburg: Murder in a German Village) on the subject of witch hunts and why vulnerable women or young girls are most frequently the victims of these sort of hunts which seek to expunge “evils” from within a group.